The Kukree food truck is not the end game. 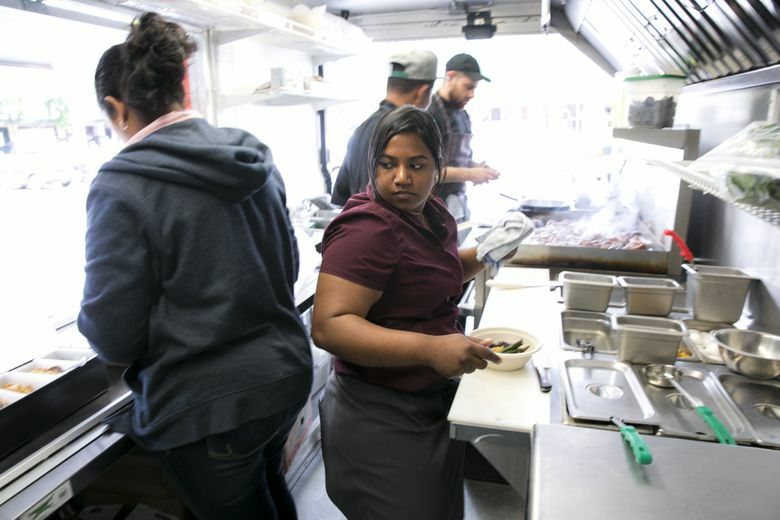 For chef Aarthi Sampath and co-founder Shilpi Gupta, the truck is a mobile test kitchen for their restaurant vision. And its popularity is a great sign for the future. Her star seemed aligned to the bright lights of New York City; she was the chef de cuisine at the Michelin-starred Junoon in the Flatiron District and, up until February, was sous chef for the estimable April Bloomfield at The Breslin in NoMad. So, what on earth, her friends and family want to know, is she doing in Seattle, running of all things … a food truck, rising at the ungodly hour of 5:15 a.m. to whisk chimichurri sauce and poach eggs for the lunch run? And not just any lunch. Sampath is convinced she can get us to love quinoa. Yes, quinoa. Sure, she serves hanger steak. But she doesn’t ask how you want your steak cooked. Hopefully, you will like it medium-rare. Since we’re getting all Soup Nazi about this, her food truck, Kukree, is not some Chipotle on wheels. There will be no customizing of your own bowl. She will serve you millet and amaranth instead of brown rice. She will sprinkle seeds, greens and beans if she chooses. She will serve it in a compostable, wheat-straw bowl for $10.95. This is what Sampath moved to Seattle for. Launched in mid-March, the Kukree truck parks near the Amazon and Microsoft campuses, as well as office towers in Seattle, Bellevue and Redmond. It’s a mobile test kitchen for a restaurant Sampath and an investor are opening in Seattle next spring, with an eye toward expanding nationwide, L.A. and N.Y. maybe. 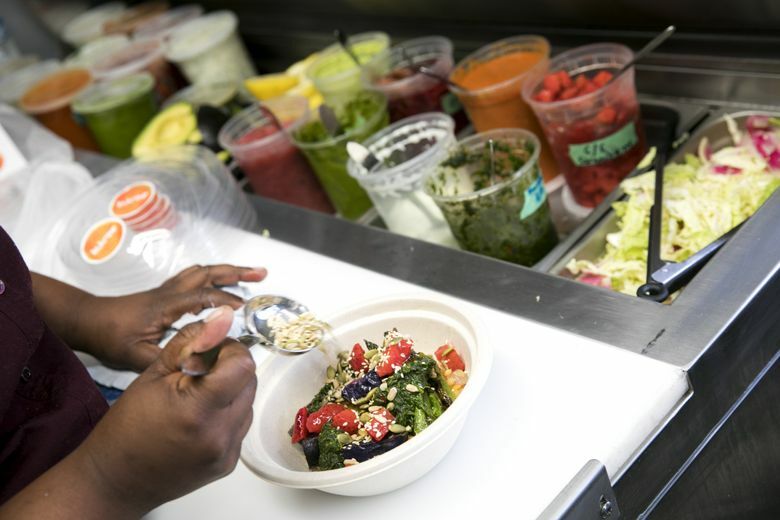 Here, Sampath composes healthful, gluten-free lunch bowls, with some of the superfoods of say, an acai bowl. Hers is a mishmash of chutneys and flavors of her Mumbai upbringing melding with Mediterranean and other Asian flavors. Served with steak or chicken. Or maybe a take on biryani or grits. How has it played? 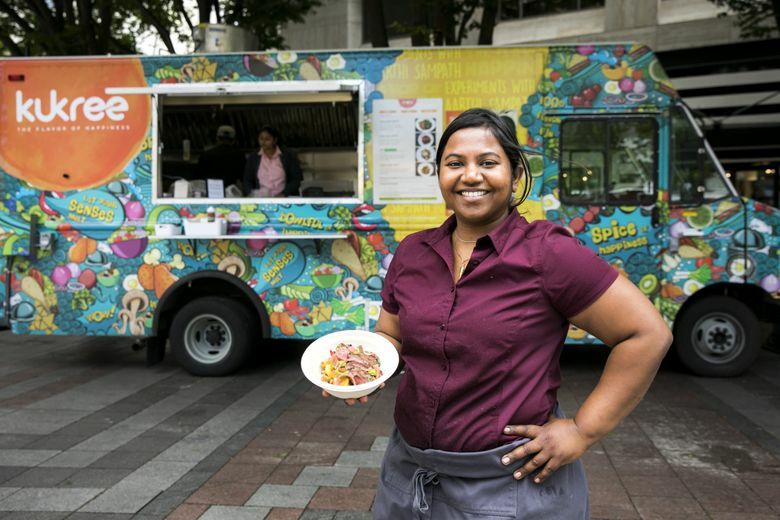 At a food-truck pod on a recent Wednesday in Westlake Park, the line snaked across the plaza with office workers and tourists waiting up to 20 minutes at noon for her food. By 12:16 p.m., she sold out of her braised lamb-shank special; by the end of lunch, she sold 158 grain bowls. Those are Tom Douglas-level numbers. That’s how many orders are sold at Douglas’ Home Remedy eatery, arguably the most popular rice bowl around the Amazon campus. Sampath almost missed out on it. Last June, she forgot to reply to an email an Amazon software developer sent her one morning about a business opportunity — until two weeks later. That email was from Shilpi Gupta, a Greenwood resident who had helped launch Prime Video to 200 countries in 2016. Gupta left the tech sector to get into the restaurant business. Sampath’s résumé was shining. After getting her culinary degree at Johnson & Wales in Rhode Island while on a student visa, she rose from intern to chef de cuisine at Junoon in three and a half years. That led to a stint as executive chef in Orlando, Florida, before she returned to the stage of New York City to work at the critically acclaimed gastropub The Breslin. Her Food Network stint started on “Chopped.” In an email, “Chopped” host Ted Allen recalled how impressed the panel was with her “progressive Indian cuisine” and how she didn’t make a single, bad dish on her inaugural Food Network appearance. Sampath thought Gupta was on to something just as exciting 3,000 miles away in Seattle — health food, something she could relate to. She was exhibit A: Sampath gained 50 pounds working long hours in the kitchen, eating fried and processed foods instead of the high-fiber, high-protein grains she grew up with. She wanted to get back to the food of her roots. Gupta, the CEO and co-founder of Kukree, took Sampath on as a business partner and chef. Sampath batted around ideas for health food, targeting millennials mostly, but also for busy workers who rely on greasy takeout and pizza. In their research, they found many healthful takeout options tasted bland. They are planning a restaurant more in line with what famed restaurateur Danny Meyer called “Fine Casual,” which adopts the order-at-the-counter model, but where the food quality is closer to gourmet or a fine-dining experience. Sampath has been testing these grain bowls, a big component of the Kukree brand, in the truck. It pays to have Amazon-deep pockets. They’re mums on how much they have invested. But for starters, they paid $90,000 for a food truck, twice what many truck chefs pay — a used 2007 Ford E350 with 14,000 miles but decked out with state-of-the art kitchenware. Most food trucks adopt a fast-casual concept when it comes to rice bowls, more assembling than cooking from scratch on the truck. Kukree, on the other hand, makes most ingredients in small batches, and others are made to order. 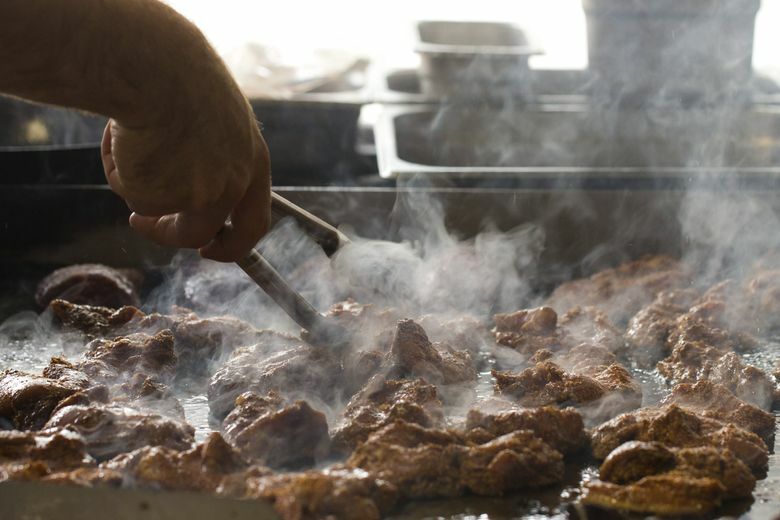 To crank out food as fast as other food trucks, Kukree employs three cooks and a cashier, when many bootstrap trucks make do with two. It’s a manic, more costly setup than a food truck needs to be. But Sampath is looking at the end game. Seattle is so oversaturated with restaurants, Kukree must establish a brand name to stand out from the pack, Sampath said. If that means hiring a line cook to sauté Swiss chard with garlic for every order with the hanger steak, then so be it. Sampath doesn’t market the gluten-free bowls as healthful eating. Her menu doesn’t mention that white and brown rice aren’t served. Her grains are labeled “KGB,” which in fine print stands for “Kukree grain blend,” a nutty, earthy medley of quinoa, millet and amaranth. The chicken biryani she made to beat celebrity chef Flay on his cooking show is, as you would expect, the food truck’s best-seller. But it’s the least impressive. A bit over-the-top, a bit overworked, it’s served with two poached eggs, cucumber-mint yogurt, shaved veggies, fried shallots, dried cranberries along with her grain blend. Better is her spring chicken bowl, a nuanced Mediterranean-inspired dish that’s more in line with the Kukree profile; clean, bright flavors with depth — juicy pan-fried chicken with creamy lentils to contrast with her nutty grain mixture and snappy asparagus; and topped with sunchokes, strawberries, raisins and seeds, all bound with harissa sauce and a fresh squeeze of lemon. It’s tart and tangy, creamy and crunchy, savory but with a hint of fruity sweetness. It’s arguably her best effort so far. Each bowl contains eight to nine different ingredients that have been roasted, fried, pickled, braised and/or sautéed. Sampath equates starting a food truck and restaurant to her first Food Network appearance. What was meant to be a less helter-skelter pace has turned into a 65-hour-a-week gig already, between testing new dishes and scouting Seattle neighborhoods for restaurant space. She hits the farmers markets from Ballard to Queen Anne, oohing and aahing over how the cherry and asparagus season seem to last for eternity. In New York the seasons are so short, “we have to get them from California or Washington,” she said. She vows to keep her Sundays free to have a semblance of a life to explore her neighborhood, Belltown. She likes JuneBaby in Ravenna and Damn the Weather in Pioneer Square and is trying to make time to hit Willows Inn on Lummi Island. On her to-do list, she realizes an important task remains: “I have to get a driver’s license,” she said. She’s not in New York City anymore.